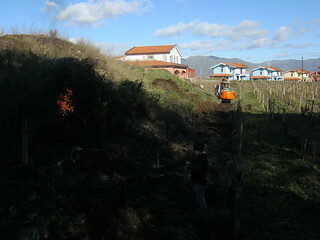 Since last year we have a large vineyard in lease in Rovitello, around 3 hectares. This is an old vine alberello vineyard which has been modified into rows to be able to mechanize work. 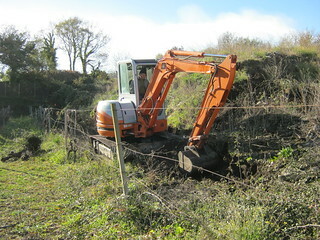 A bit old and not well maintained, and oddly situated in between the golf corse Il Picciolo, we are doing a serious maintenance job and putting in new poles which were broken to be able to work better with a tractor. All access roads and turning spots for the tractor are also being cleared and enlarged. 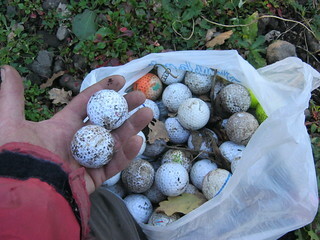 During work we found so many golf balls, I am getting worried not wearing a helmet working in this vineyard! Rovitello in general is a tricky place for maturing grapes as it is an area subject to cold air and humidity in the mornings. On the other hand, the Nerello Mascalese wines from this area have a silky tannic structure which few other areas can express, being far more bold and structured. Over the next few years I hope to understand better this vineyard site called contrada Picciolo, to be able to produce a single vineyard wine from this cru in great vintages. This entry was posted on Tuesday, January 21st, 2014 at 10:30 pm	and is filed under Work in Progress. You can follow any responses to this entry through the RSS 2.0 feed. Both comments and pings are currently closed.